You can't relocate your porch, patio, deck, or poolside area every time the weather changes, but you can use retractable awnings to protect those areas. A retractable canopy gives you the freedom of having an uncovered outdoor area AND the security only a high-quality retractable awning can provide. eCanopy.com offers both manual retractable awnings and motorized retractable awnings that fit your budget. Not sure what retractable awning to purchase? Check out our Retractable Awning Buyer's Guide below written by one of our awning specialists and find the right retractable awning prices for you today. What kind of fabric is available? Please describe. On our most popular awnings, made by Awntech, the fabric is a 100% solution dyed acrylic fabric; fade, water, soil and mildew resistant. It's soft but resilient. Thank you for your inquiry! Unfortunately we do not offer customized retractable awnings at this time. Thank you for your inquiry. Is there such a thing as a 3' retractable awning with manual crank that goes over a door? I'm looking for a 24 ft awning retractable unit. How far from under the soffit will it cover (at least 10 ft)? Also, for my camper, will rain or water come through, leakage, or will it be like my camper's awnings, where there is no leakage? Our awnings are for shade only, it is not advisable to use during inclement weather. The widest retractable awning we carry is 12 feet, and it extends 122 inches. Do you offer a full cassette retractable awning, motorized in a 10 foot width? Thank you. We need to replace the fabric of a retractable awning of 13 by 6 feet. We are considering just buying the fabric and installing it ourselves. Unfortunately, we do not carry replacement fabric for awnings. You will want to speak directly with the manufacturer of your awning. I'm looking for a 10' x 10' retractable awning. All of our 10 ft retractable awnings only have a max projection of 8 ft. I currently have a roof mount retractable awning that I need to replace. Are these awnings only available for wall mount? All of our awnings are wall mount only. I need a 12' wide manual retractable awning. It is white powder coat metal with a white or off-white canvas. Attached are a couple of photos of what I am trying to match. Thank you. How far will this 6 ft awning project from the house to which it is attached? I apologize, but we do not have a 6 ft retractable awning available. What is the maximum extent from the wall for a 20 ft width? Are there any multi-color options? The 20 ft retractable awnings will extend along a 122 inch projection and the colors for each style will be listed on the product page. What is the difference between the Key West, Destin and Galveston? Thank you for your inquiry. The Galveston is a 75% encased awning, Key West has a Full encasement, the Destin has a protective hood that awning tucks under when closed, the Maui does not have any additional protective items like the above mentioned awnings. Great for people mounting under a soffit. Can these be installed under an eve/overhang? 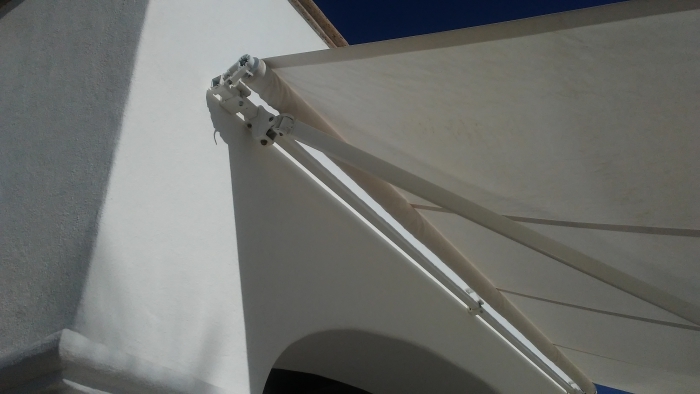 These awnings are designed to be attached to the studs in the outer wall for stability. What is the projection of a 20 foot awning? The projection of the 20 foot wide awning is 122 inches. Are you in the market for a retractable awning? Whether you're a novice or just brushing up on the facts, you're in the right place. In this article, we'll cover everything you need to know. From the benefits of ownership, to accessories you may need, to final installation. We'll even let you in on who makes some of the top brands today! We have all the information you need right here! Lots of people enjoy the look an awning can add to their home or business. If that includes you, there are some considerations you should take into account when choosing the right awning. For example, make sure both the awning will be the right size for your space and if an installation permit is required in your area. Have you ever considered the benefits of a retractable awning? Maybe that's what brought you here in the first place. While you may like the look an awning can add to your home or business, did you know they can also increase energy efficiency? That's right. A retractable awning can reduce sunlight, glare, and protect you and your outdoor furniture from rain, which will improve the longevity of those belongings. Retractable awnings can be mounted to walls, and unlike their stationary counterparts, you can mount them on roofs. Or if the rain or wind gets too severe, you can retract it, keeping the awning out of harm's way. So now you're set on getting a retractable awning? Before you buy, you'll need to take measurements to find the right size awning for your specific needs. No worries though, finding the correct size is pretty straightforward. First, decide where you want the awning. Now, measure the space the awning will cover. If it's going over a door or a window, you will want to make sure you give yourself enough room to open and close it. You'll measure the dimensions of the wall, height being the most important — you don't want your friends or family to bump their heads on the awning! Then you will need the width so you can order the right size for your home or business. After this, you'll need to determine the height, width, and projection you want the awning to cover. If you're wondering what projection is, it is how far the awning will stand out from the side of the building when fully extended. Now that the measurements are done, determine if the retractable awning you have your eye on will require a specific framing position and leg supports. Many awnings have minimum heights required for proper installation, and if you live somewhere with a homeowner's association, they may have rules about your retractable awning. In some areas, you'll need a permit from your local government before making any change to the outside of your home. Make sure you look into that before a purchase is made. You have a variety of options available to you when looking for the right retractable awning. You have a choice in fabrics for your canopy, different accessories, and, most importantly, the brand you'll eventually put your trust in. So, in this section, we will give you a brief overview of what to look for in regards to materials, accessories, and brands. When we say "fabrics" or "materials" we are talking about the canopy of your retractable awning. What your canopy is made of will determine its durability under certain conditions. We'll go over what you can expect with each material so you can better understand what will be right for you. Canvas — This one is durable, but expensive. It's also organic, but prone to develop mildew faster and more intensely than the other materials. It has the best tensile strength out of all the fabrics, but more prone to suffer from environmental exposure like UV deterioration. It's also the least hydrophobic of the retractable awning canopies. PVC — If you're willing to sacrifice durability for something flexible and waterproof, PVC may be right for you. PVC is a type of plastic, which means it's naturally resistant to mildew. It's also more affordable than canvas. However, with these pros, there's certainly some cons. Remember, you're sacrificing durability. PVC is the most prone to ripping and tearing out of all the materials here because in terms of tensile strength, it ranks the lowest. Polyester — If you're looking for something in the middle of the road that's also affordable, take a look at Polyester. It has price points similar to PVC, but with better durability. It's not waterproof, but it retains less water than canvas. It's also mildew resistant and UV resistant although depending on where you live, you may want to treat it so it can be even more so. Aluminum — When you don't care about flexibility and want the most durable option available, there's aluminum. It's naturally rust, mildew, and UV resistant with great tensile strength. However, aluminum's inflexible nature means it's more likely to be pulled off its scaffolding than tear so keep that in mind if you live in a high wind region. Acrylic — There are two types of acrylic materials used for awning canopies. The first is canvas coated in acrylic. The second is acrylic fibers; these are more like polyester. Acrylic coated canvas is much like canvas but more durable and resistant to harsher climates. Acrylic fibers are hydrophobic like polyester but a little more UV resistant. Overall, the climate where you live should factor heavily into what material you choose your canopy to made of. Retractable awning accessories are all ease of use — meaning they make them easier to use. You'll find motorization, sensors for inclement weather, and weather guard covers. Motorization controls — These can extend or retract your awning automatically and can be operated using a wall switch or remote. Weather sensors — If you decide to get motorization controls, think about weather sensors as well. These will detect wind, rain, and sun, and retract or extend your awning automatically. Weather guard covers — If you decide to go for a roof-mounted awning look into a weather guard cover. They protect the first six to eight inches of the canopy, to help preserve its appearance and durability. Alright, so you have the material and accessories in mind, but now you need a brand that's right for you. In this section, we are going to go over a few top awning manufacturers so you can make the best decision possible. Advaning — They are a US-based company out of California. 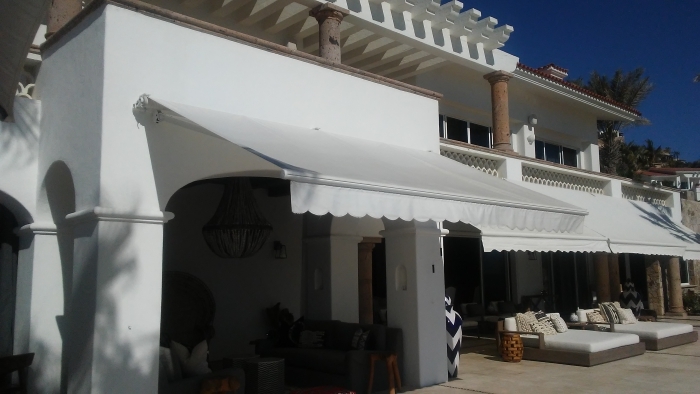 They produce manual and motorized retractable awnings for your home or business in a plethora of sizes and colors in solid and striped patterns. They even have free-standing awnings that don't need to be attached to your home. Awntech — This company out of Texas offers residential and commercial awnings and pride themselves in their "Do-It-Yourself" assembly designs for each awning they make. They offer acrylic canopies in neutral, vibrant, solid and striped colors. Outsunny — With Outsunny you'll find mostly manual retractable awnings in a variety of sizes and colors. Most of their stock fits over windows and doors although you can find some bigger sizes, albeit with less color variation. SunSetter Awnings — These awnings are some of the most customizable you can find with different fabrics, patterns, and sizes to pick. Sunsetter even has an XL size retractable awning and free-standing awnings as well. Now you are moments away from purchasing your retractable awning — but wait! What about installation? In this section, we will help you with that. 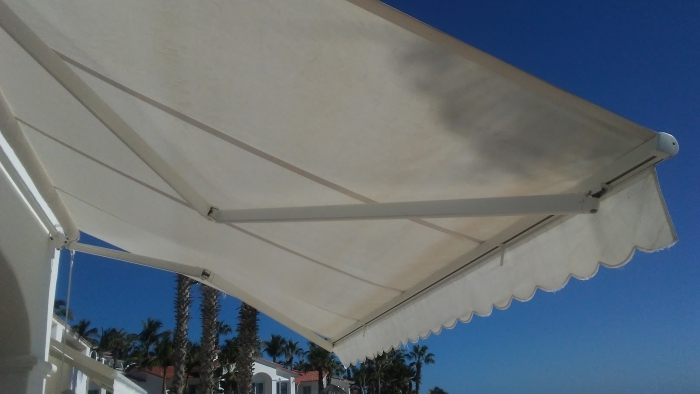 Remember, each awning will come with its own set of installation instructions so if any questions come up, take a look at those before coming here. First, you'll need a tape measure and a level to install the mounting brackets. After installing the brackets, you should take the time to seal the edges of the mounting brackets with silicone sealant. Here's where the installation process will vary based on what you've purchased, although many manufacturers use a mounting rail that attaches to the mounting brackets. Once you've attached the rail, the awning house is the next to go on. From there follow the instructions given by the manufacturer and you should be golden. Note — Spacing and leveling the brackets properly is the primary focus. It ensures correct installation. Once installed, make sure the awning operates properly and check that everything is secured appropriately. Alright, so you've bought the awning, it's installed, now what? Well, you take care of it, that's what! But how do you do that? Here is what you need to do the make sure you and your retractable awning have a long, happy, and problem-free life. Your awning is up and it's a beautiful day outside, this is a great time to take a look at that warranty information the manufacturer provided. That sounds like a joke, but it's not. It's always important to review the warranty and care information in case a sunny day breaks out into a storm and causes a problem. Some of the best care tips for your specific awning are in the care information. But seeing as how we don't have your particular booklet here, we'll instead offer you some general care tips. After exposure to moisture, be sure to let your awning to air dry. Don't heat the fabric. Once dry, feel free to roll the canopy up. When cleaning the awning, use lukewarm water with a mild, non-detergent soap. If you have a vinyl canopy, use a soft brush or a stiff brush for acrylic. After any precipitation, clear the excess water and debris like snow or sticks. Every so often, check the all the fasteners on your awning to make sure they are still tight. Keep an eye on the wiring and connections for any wear and tear. And remember, it's discouraged to do any care not recommended by the manufacturer as that could void the warranty. Be sure to check the length of your warranty as well because they vary from company to company. Now that you have a tremendous new retractable awning, it's up to you to make sure it survives many years. Most awnings have a lifespan of between 5 and 15 years. Yes, that is a big difference, but that does depend on what you're using it for and the location. Here are a couple of things to watch for that will reduce the life of your awning. UV — The Sun's rays will degrade your awning over time. Some materials handle UV radiation better than others, but at the end of the day, they are all susceptible. UV rays will fray or melt the fibers of your canopy as well as causing the colors to fade over time. Now you can use a naturally durable material or purchase a UV coating that can block or reflect UV rays. Mildew — Similar to UV treatments, you can coat your canopy to help avoid mildew. However, those treatments do not last long. Mildew is more of a problem on fabrics rather than metal, but some manufacturers can treat the canopy before it's woven or welded to protect it on the inside and outside. Severe Weather - One of the easiest ways for a retractable awning to meet an early demise is exposure to the high winds or hail that can come with severe weather. Don't take a chance with your retractable awning. Be sure to retract it any time the weather takes a turn for the worse. In this next section, we're going to cover some things to think about when purchasing or owning an awning we didn't get to earlier. One thing to be mindful of before purchase is the structural integrity of your home or business before attaching an awning. The size of your structure or the siding can affect the awnings installation. If you want or need more information on mounting your awning safely to walls or roofs check out our Complete Guide to Anchoring your Awning. Also, be aware that retractable awnings can be expensive initially as well have more costly repair bills so be sure you take all the steps necessary to give your awning an extended life. Alright, you did it! You know everything you need to make the right choice when selecting a retractable awning for your home or business. Now take a look at our excellent selection. Or, if you want to know more about awnings, we have some handy links for you down below. See our selection of Retractable Awnings and pick the right one for you! Need more insight on how to anchor your awning to your home or business?